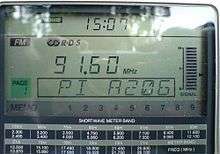 Radio Data System (RDS) is a communications protocol standard for embedding small amounts of digital information in conventional FM radio broadcasts. RDS standardizes several types of information transmitted, including time, station identification and programme information. The standard began as a project of the European Broadcasting Union (EBU), but has since become an international standard of the International Electrotechnical Commission (IEC). Radio Broadcast Data System (RBDS) is the official name used for the U.S. version of RDS. The two standards are only slightly different. The data is sent with error correction. RDS defines many features including how private (in-house) or other undefined features can be "packaged" in unused program groups. RDS was inspired by the development of the Autofahrer-Rundfunk-Informationssystem (ARI) in Germany by the Institut für Rundfunktechnik (IRT) and the radio manufacturer Blaupunkt. ARI used a 57-kHz subcarrier to indicate the presence of traffic information in an FM radio broadcast. The EBU Technical Committee launched a project at its 1974 Paris meeting to develop a technology with similar purposes to ARI, but which was more flexible and which would enable automated retuning of a receiver where a broadcast network transmitted the same radio programme on a number of different frequencies. The modulation system was based on that used in a Swedish paging system and the baseband coding was a new design, mainly developed by the British Broadcasting Corporation (BBC) and the IRT. The EBU issued the first RDS specification in 1984. Enhancements to the alternative frequencies functionality were added to the standard and it was subsequently published as a European Committee for Electrotechnical Standardization (CENELEC) standard in 1990. In 1992 the U.S. National Radio Systems Committee issued the North American version of the RDS standard, called the Radio Broadcast Data System. The CENELEC standard was updated in 1992 with the addition of Traffic Message Channel and in 1998 with Open Data Applications and, in 2000, RDS was published worldwide as IEC standard 62106. The RDS-Forum (Geneva / CH) decided at its annual meeting (8-9 June 2015) in Glion/Montreux to bring the new standard RDS2 on the way. The standard will be created in close collaboration with U.S. colleagues from NRSC RBDS-Subcommittee and should offer a unified platform for FM broadcasting and data services worldwide. New character coding: UTF-8 (old EBU Charset remains for compatibility mode for the old 0A/2A Groups). New ODA handling, "B" groups are assigned as signalling group to the “A” groups. Supports return channel over gRT if the receiver has IP or SMS capability. A Radio Data System – Traffic Message Channel (RDS-TMC) receiver (left) attached to a TomTom navigation system to integrate real-time traffic data into the navigation. This allows a receiver to re-tune to a different frequency providing the same station when the first signal becomes too weak (e.g., when moving out of range). This is often used in car stereo systems. Can synchronize a clock in the receiver or the main clock in a car. Due to transmission vagaries, CT can only be accurate to within 100 ms of UTC. Allows the receiver to monitor other networks or stations for traffic programmes, and automatically temporarily tune into that station. This is the unique code that identifies the station. Every station receives a specific code with a country prefix. In the US, PI is determined by applying a formula to the station's call sign. This is simply an eight-character static display that represents the call letters or station identity name. Most RDS capable receivers display this information and, if the station is stored in the receiver's presets, will cache this information with the frequency and other details associated with that preset. This coding of up to 31 pre-defined programme types (e.g., in Europe: PTY1 News, PTY6 Drama, PTY11 Rock music) allows users to find similar programming by genre. PTY31 seems to be reserved for emergency announcements in the event of natural disasters or other major calamities. This is mainly used in countries where national broadcasters run "region-specific" programming such as regional opt-outs on some of their transmitters. This functionality allows the user to "lock-down" the set to their current region or let the radio tune into other region-specific programming as they move into the other region. This function allows a radio station to transmit a 64-character free-form text that can be either static (such as station slogans) or in sync with the programming (such as the title and artist of the currently playing song). The receiver can often be set to pay special attention to this flag and, for example, stop the tape/pause the CD or retune to receive a traffic bulletin. The TP flag is used to allow the user to find only those stations that regularly broadcast traffic bulletins whereas the TA flag is used to signal an actual traffic bulletin in progress, with radio units perhaps performing other actions such as stopping a cassette tape (so the radio can be heard) or raising the volume during the traffic bulletin. Digitally encoded traffic information. 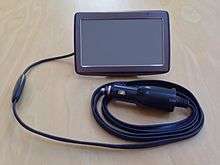 Not all RDS equipment supports this, but it is often available for automotive navigation systems. In many countries only encrypted traffic data is broadcast, and so an appropriate decoder, possibly tied to a subscription service, is required to use the traffic data. As far as implementation is concerned, most car stereos will support at least AF, EON, REG, PS and TA/TP. More expensive car stereos will offer TMC, RT and / or PTY, perhaps with "NEWS" override. Home systems, especially hi-fi receivers, will mainly support functions like PS, RT and PTY. There are a growing number of RDS implementations in portable audio and navigation devices thanks to lower-priced, small-footprint solutions. The later RBDS standard made no attempt to match the original RDS plan, therefore several identical radio formats were given different numbers, including jazz, weather, sports, and rock. Other similar formats such as varied/college and phone-in/talk are also mismatched. This is mainly a problem for Americans taking portable radios out of their country. The following three images illustrate how RDS can be used on an FM radio station; the latter two were taken when the radio was tuned to Nottingham radio station Trent FM. All the images are of the display on the Sony XDR-S1 DAB/FM/MW/LW portable radio. Typical radio display showing the PS name (programme service) field. Sample Radio Text usage, in this case showing the name and artist of the song being broadcast - Duran Duran's Save a Prayer - the bottom line scrolls to reveal the rest of the text. In addition, RDS is being proposed as the data transmission protocol in California's "Programmable Communicating Thermostat" (PCT) program. The proposed technology would allow electricity consumers exposed to “time-based pricing” for electricity to respond to an RDS signal containing price information when their retail electricity price changed during periods of high wholesale electricity costs or abnormally high demand that threatened the stability of the electricity grid. The PCT could then automate any actions that the consumer had pre-programmed the device to take. For example, if the price of electricity went up on a hot afternoon because of extremely high demand, the consumer could preset the PCT to raise their air conditioner cooling set point by a few degrees in order to reduce their overall electricity consumption and bill. The technology could be extended to other home electricity consuming devices such as water heaters, clothes dryers, dishwashers, swimming pool pumps, etc. allowing consumers under time-based pricing for electricity significant automatic control over their electricity consumption during periods when the price of electricity is naturally higher than normal (see load management). The goal is to give consumers a choice between paying more for high value peak electricity, or reducing their lowest value loads at those times. Such voluntary “demand response” behavior could significantly reduce the price of electricity during non-peak periods because of reduced need for infrequently used peaking power plants, and also reduce the chances of blackouts during emergency events when the electricity grid is stressed or damaged. RDS subcarrier use for the control of peak power has been in development in Australia since early 2000. ETSA the South Australia Electricity Trust and Saab Systems Australia, a local South Australian company, pioneered the idea after Saab engineer Trent Ryan developed the idea in late 1999 and brought it to Saab for further refinement. In Sweden, RDS PTY signalling is used to let the public service broadcaster break into commercial radio station transmissions to broadcast emergency warnings. Companies such as ST Microelectronics, Silicon Labs in Austin, Texas and NXP Semiconductors (formerly Philips) offer single-chip solutions that are found in these devices. ↑ "NRSC-4-B United States RBDS Standard" (PDF). National Radio Systems Committee. 1 2 3 4 "March 2009: RDS is now 25 – the complete history" (PDF). Geneva, Switzerland: The RDS Forum. 2009-03-27. p. 1. Retrieved 2011-06-15. ↑ "IEC Webstore Publication detail: IEC 62106 Ed. 1.0 English". Geneva, Switzerland: International Electrotechnical Commission. Retrieved 2009-05-18. ↑ "Traffic Receiver". TomTom. Retrieved 15 June 2014. "NRSC-4 National Radio Systems Committee United States RBDS Standard – Specification of the radio broadcast data system (RBDS)"
RDS: "The Radio Data System", "The Broadcasters Guide to RDS"
xRDS "Extending the RDS data transmission capacity"
"xRDS presentation at the RDS Forum meeting 2011"
Decoding RDS TMC program and circuit.